The professional lining of chimneys. 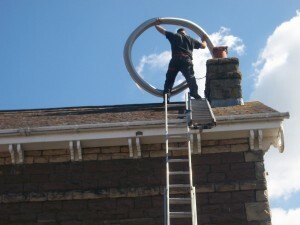 We have the knowledge qualifications and insurance to correctly and safely install flue liners that can easily be accessed for cleaning and inspection. This is vital under current building regulations. Flue liners will need to be swept just like a masonry chimney. 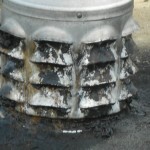 Here is an example of the effects of solid fuel chimney gases passing through an inappropriate terminal. This particular chimney in Hereford was also lined with a four inch gas liner instead of a solid fuel chimney liner . Both of which ( the terminal and gas liner ) are highly dangerous to be used in your chimney for solid fuel combustion. The most appealing focal point in any room is the fireplace. Be it an open fire, or closed appliance, the leaping flames and glowing coals are the heart of a home. However for any fire to work successfully, it must be connected to a sound chimney and correctly sized flue. The functions of a chimney are to safely remove the products of combustion from the fireplace or appliance to the outside world without causing danger to the occupants. A chimney works because hot air rises and always moves from high to low pressure. Things like running the appliance at a very slow rate or cold air leaking into the flue, will cool the gasses and effect the performance of the chimney. 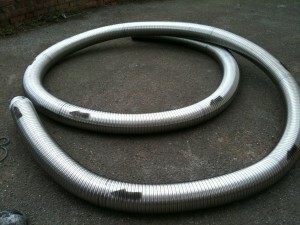 To keep the flue gasses warm, consideration must be given to the insulation value of the lining system chosen. In houses built since the introduction of the 1965 Building Regulations, all flues must be built with liners during there construction. This is usually done with clay liners, which should last the life of the building . However, in houses built prior to 1965, lining was less common. Flues were usually parged ( rendered ) on the inside with lime mortar. 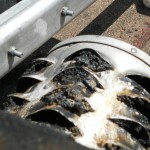 This parging suffers attack from acids and tars produced during combustion, and gradually deteriorates. 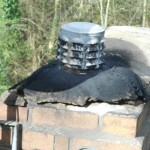 The flue is then in poor condition, often leaking fumes or tars into the walls or other parts of the building. Sadly, many houses built since 1965 suffer similar problems due to badly installed flue liners and need further attention.